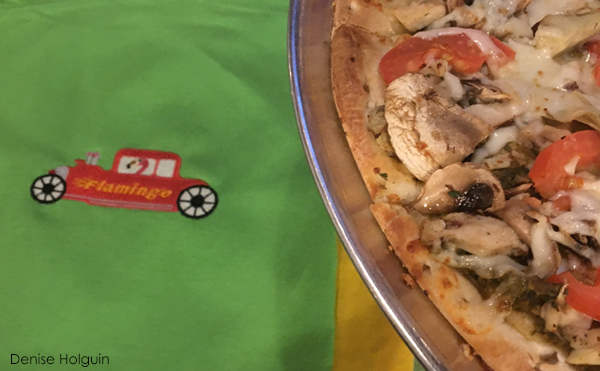 I lived, breathed and ate flamingos… in a figurative manner, of course. And as long as I’m writing in an exaggerated way, I became the flamingo. I fully embrace the flamingo lifestyle. 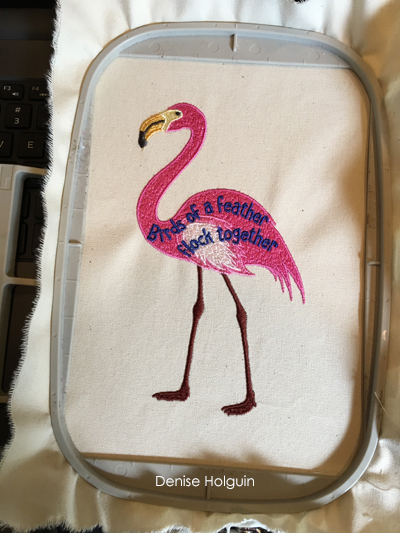 That’s the approach I took to develop my newest design collection, Fabulous Flamingos by Blue Hair Girl. The spark of an idea began with my friend, Jessica, who lives in Michigan. She loves flamingos. Whenever I’m shopping and I see flamingo themed merchandise, I snap a photo and send to her. With every snap of a photo and tag to my friend, flamingos were seeping in to the recesses of my mind. When I needed to introduce a new design collection, I scoured my mind and there they were. My pink feathered friends. Of course I had to go full-on flamingo. I don’t do anything half baked. 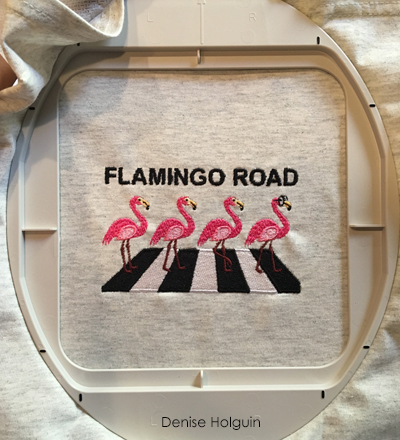 I’d sit deep in thought, contemplating the very important question, what would flamingos look like on Abbey Road? 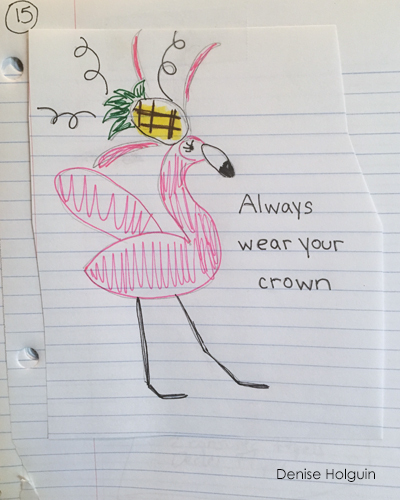 What would a flamingo look like in pearls and high heel shoes? What is the world lacking? A vaudeville flamingo. When I needed a break, I’d take my flamingo enterprise to my friend Tore. While eating pizza, I’d show him my ideas. 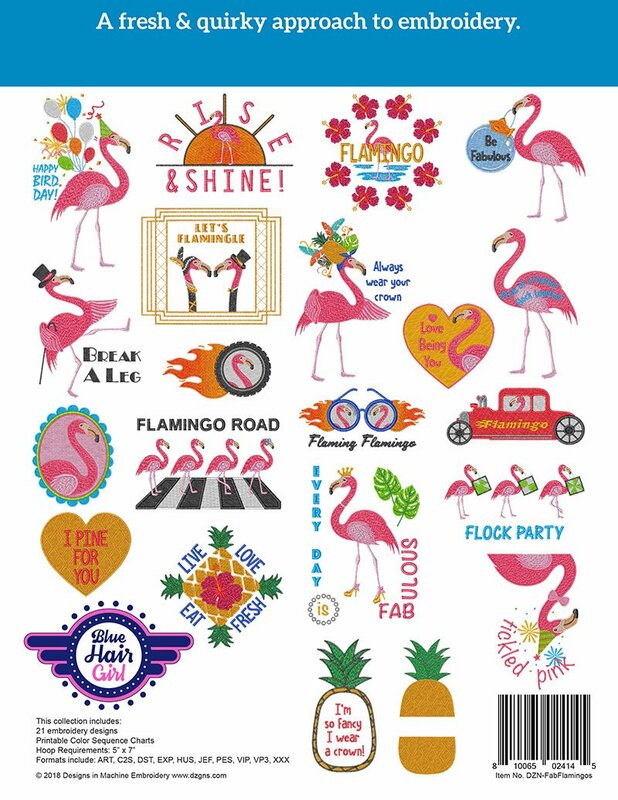 Then he’d come up with a wonderful turn of phrase that would inspire additional flamingo designs. I have a fun job. And my friends come along for the ride. Every idea was sketched on paper and colored in. When sketches were adequate to convey the idea, I’d cut them out and paste them on to my master sheet of sketches. 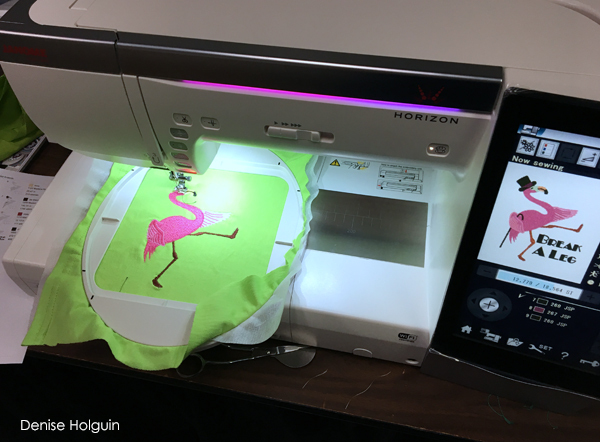 Although my drawing skills are primitive, my team of artists, designers and digitizers transform my work into the fabulous flamingos that you see today. All designs were tested multiple times on different machines in the midst of an office move earlier this year. It was quite a labor of love and a test of endurance but the results are worth it. 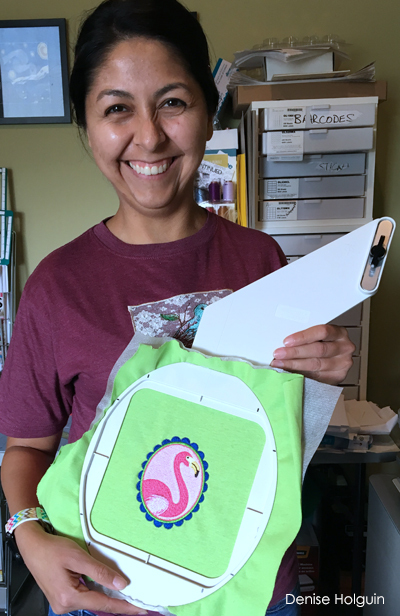 The 21 embroidery design collection is fabulously priced and makes an excellent gift for anyone you know with an embroidery machine. Or be fabulous and treat yourself to this whimsical collection. Visit the Designs in Machine Embroidery website for more information or to purchase. All designs fit in a 5″ x 7″ hoop. Just love these!! The back story is fabulous and I love seeing your sketch. You cheated and did not digitize them yourself – just kidding!!!! Now for the hard part – choosing which one to embroider first. 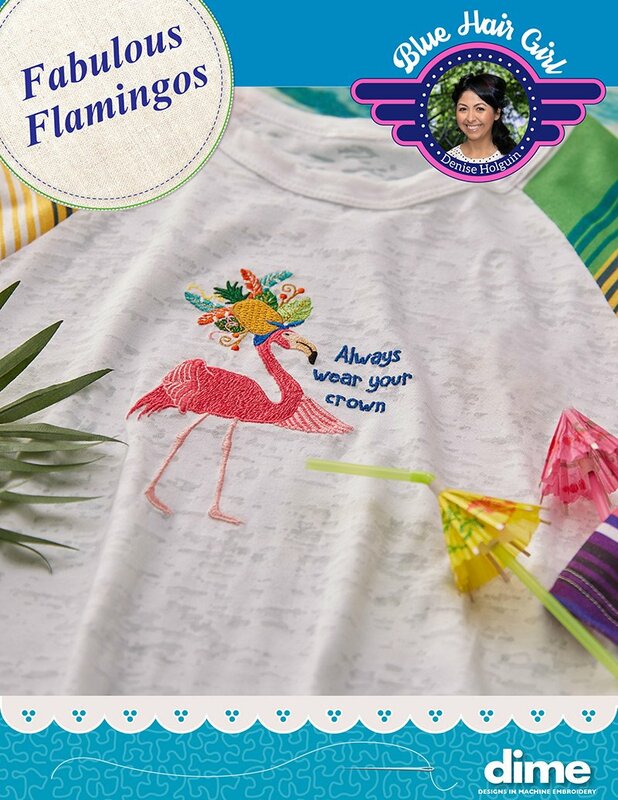 Love your flamingos! 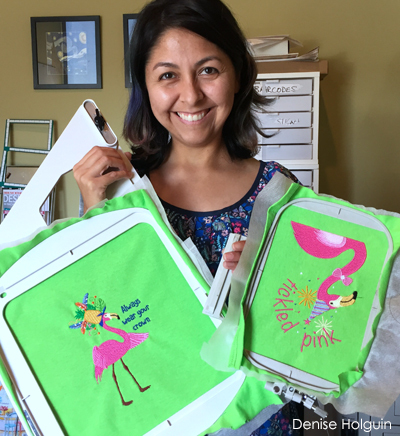 I may reach out to you for embroidery advice in the near future. My goal is to make clothes for Amelia and add a little extra with an embroidery design of some of her favorite animals or colors. Ooh, yes, that’s fun! I still remember when my mom would add embroidered patches when I was little. So I think little Amelia needs her own custom clothes. ♥️ Send me a text whenever you’re ready! Next Next post: My Work is on the Cover!